Abu Rayya, Enlightenment of the Muhammedan Sunna. Beytül Makdis (The Mosque in Jerusalem) will be the place where the resurrection and the reckoning will take place. Those who are buried there will not be subjected to suffering. Mahmud Abu Rayya, Enlightenment of the Muhammadan Sunna. Although some of these concoctions are quoted from him, those that have been transmitted by his students are far more numerous. 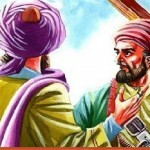 Muaviya, who had supported Abu Hurayra, had also backed up Kab and ordered him to tell parables ( Ibn Hajar, Isaba).